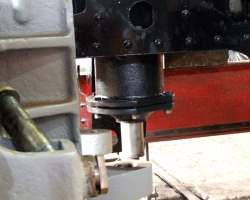 The process of returning parts to the engine frames continues; here is the refurbished steam brake cylinder. 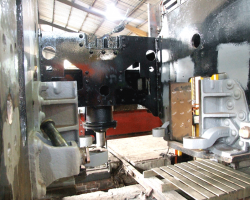 Here is a zoomed out photo showing the steam brake cylinder in position. 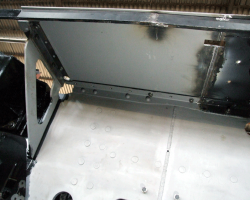 The right hand trailing sandbox has been refitted - for the second time! It had to be removed following its first reinstalment to allow access for the frame repair; this time it should be a permanent fixing! 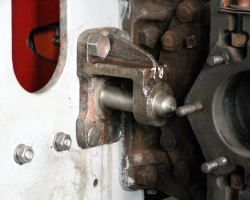 The left hand leading spring hangar bracket now permanently attached. The lower bolts have to be flat-headed to clear the hangar itself. 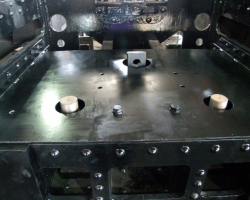 The upper steel cab floor plate is also now full fixed in place. 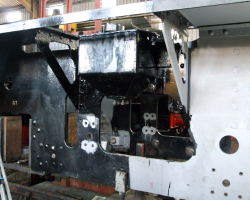 The protruding pieces are the main and two auxiliary drawbar pins to the tender. The wooden floorboards will eventually cover all this. The grey piece on the left is the new frame section behind the driving horn guide, right; the piece at the bottom is the horn clip. It should be hard up to the guide, but there is an overlap of about one sixteenth of an inch. A minor concern, easily dealt with. 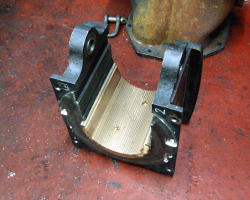 A refurbished axlebox complete with new crown grooved out, ready to accept its white metal bearing surface. DSCF0642	This is the underside of the running plate with its new steel welded to the original piece, right. 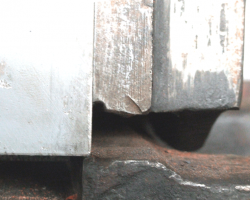 The welds between both of these and also in the frames are clearly visible. A Fund working party member attacks the new steel with a rotary wire brush, in preparation for its coat of paint. Meanwhile, another member of the team applies primer to the pony truck wheels.